Mom’s colorful Pongal Kolam (included red, green and blue) drawn for the harvesting festival – Pongal! Kolam or Rangoli is a pattern drawn (in different forms) in front of the houses, which is a traditional custom followed by the people of India esp. 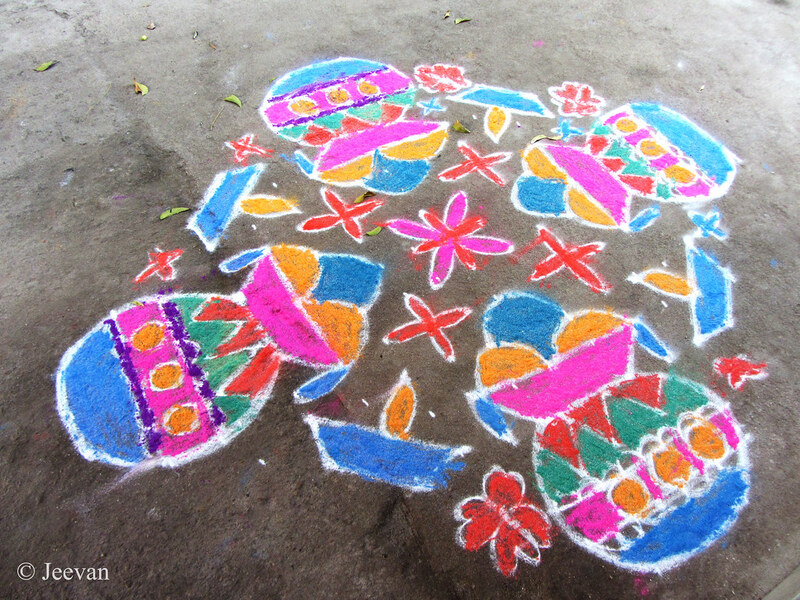 the Kolam is a cultural identity of Tamil people and drawing colorful Kolam in front of the home is considered as auspicious and a sign of welcome during the festival seasons and events. The design on the road is wonderful. Your mom did a great job on this. It is an interesting custom of which I have never heard of before now. I bet the festival is a fun time for everyone and is very colorful too. A really nice Kolam, Jeevan. My cousin is very good at this and she has even painted some in her house. You mom is VERY talented.... what gorgeous colors... I wish I had a tiny bit of that kind of talent... Beautiful. What a great custom! I love the colours! So festive and cheerful! Well done Mum! I always enjoyed admiring at the beautiful Kolam designs. It takes a person with great passion and patience to colour these masterpieces. That is such a beautiful kollam! lovely! Flood relief or payment to vote?